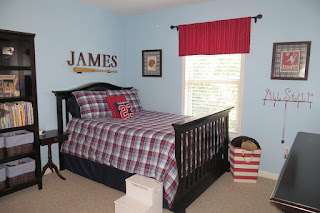 I decided to redo my boys' bedrooms and the playroom all at the same time! (smart huh?) I'm not sure what got into me but it's done! 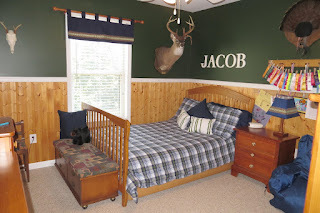 My 8 year old's room is outdoor themed with the main colors of green & navy. The bedding came from Pottery Barn Kids. The green limb throw pillows came from Land of Nod. The big joe bean bag chair came from Walmart. 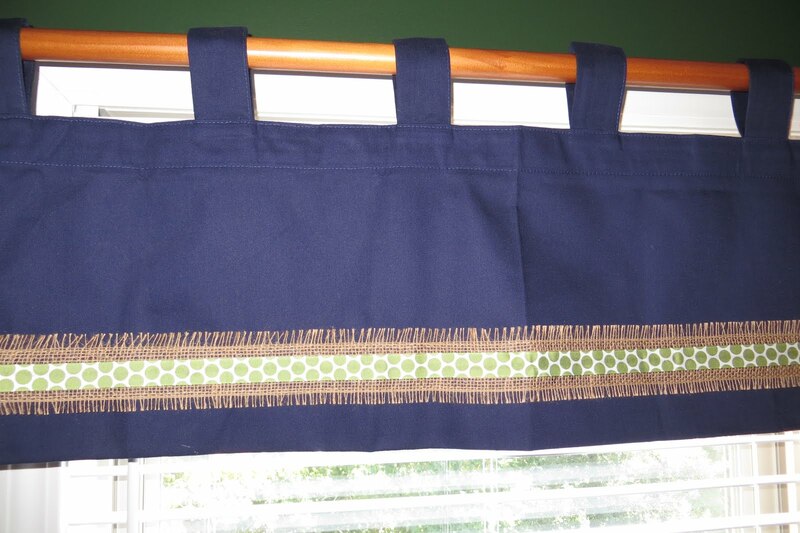 I found a plain navy valance & lamp shade and glued on the burlap & green ribbons. 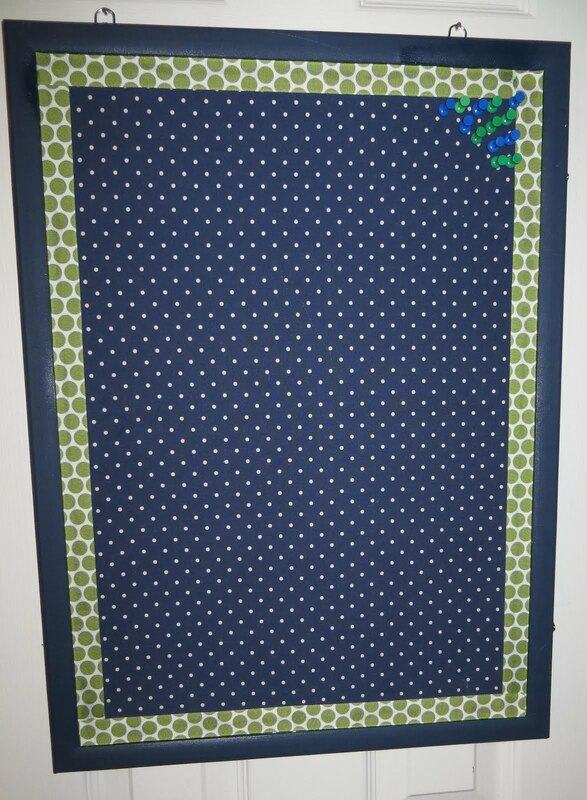 I made the bulletin board by painting the edges navy, using spray adhesive to attach the navy fabric, & using glue to attach the ribbon border. 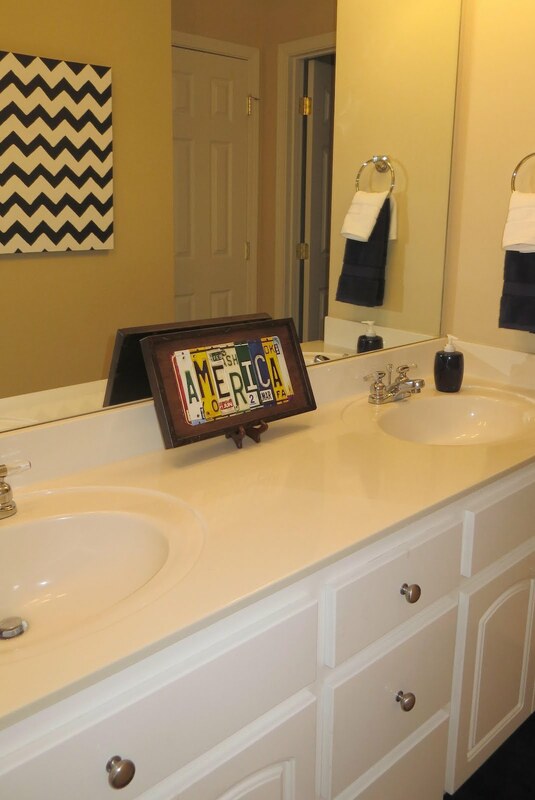 His bathroom is white & navy. 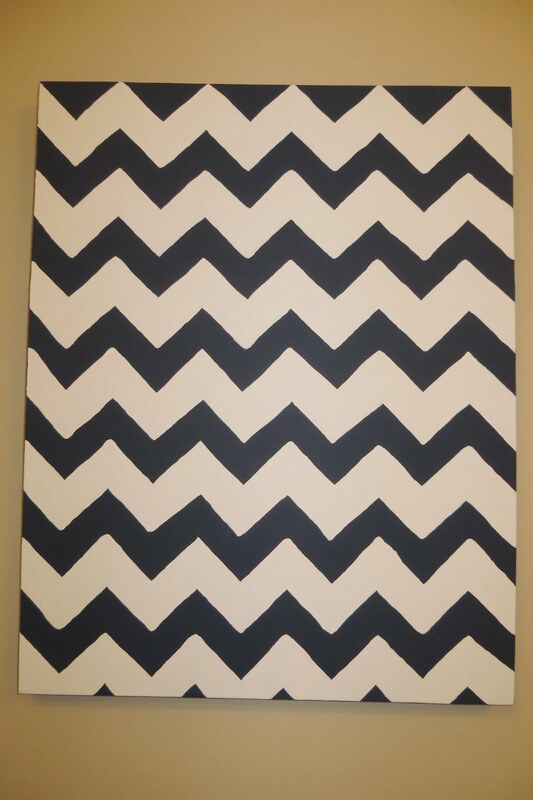 I made this blue and white chevron painting for the bathroom. I painted the canvas navy. 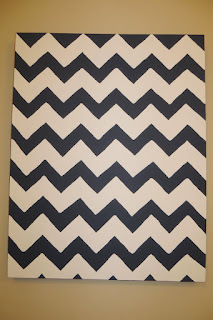 Then I traced the chevron pattern from a Silhouette cut out and painted in the white. I'm happy with it but it sure was a pain - 6 coats of white! 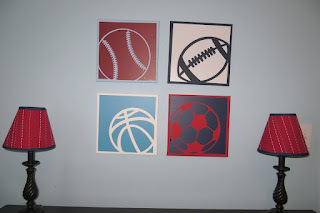 My almost 5 year old's room is sports themed with the main colors of navy, red, & light blue. 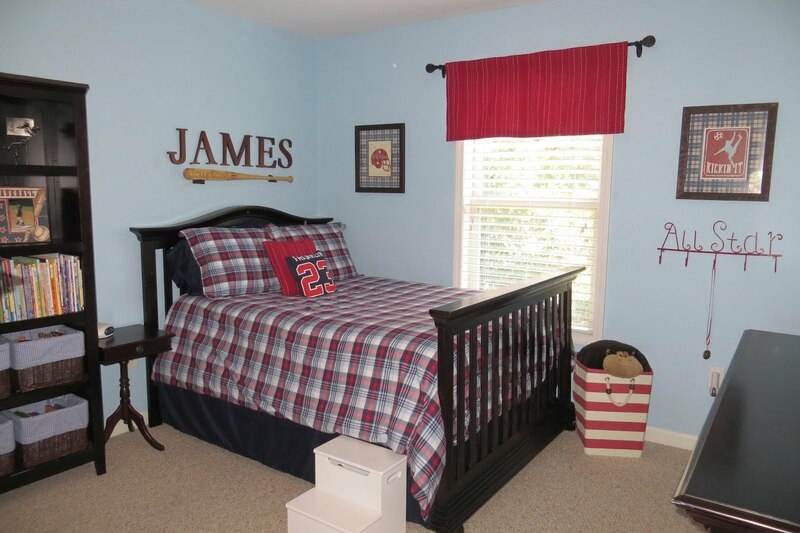 I got the bedding at Pottery Barn Kids. 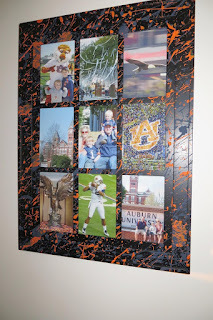 Most of the sports decor and pictures came from Hobby Lobby. 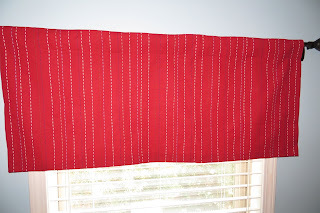 Pottery Barn Kids had this curtain that was perfect but it only came in a panel and I needed a valance. So, I went ahead and bought the panel and cut it off and hemmed it with iron on hem tape. 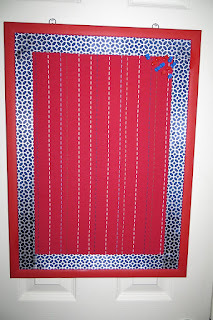 I used the extra fabric to make a bulletin board, 2 lamp shades, & a throw pillow. 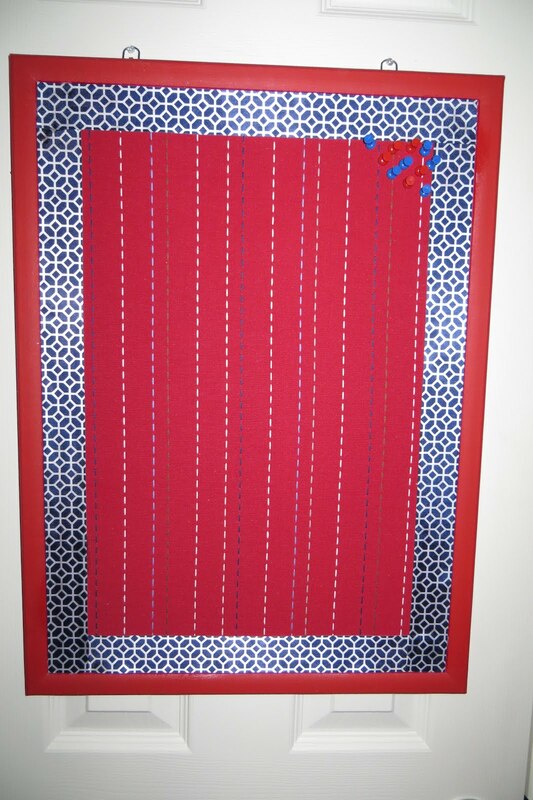 I made the bulletin board the same way as before: painted edges red, used spray adhesive to attach fabric, & used glue to attach ribbon border. 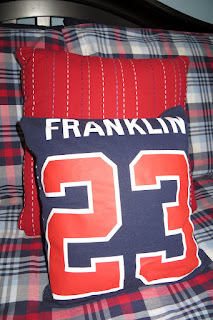 I made these 2 throw pillows - one with the extra curtain fabric & one with an old baseball jersey. I cannot sew so I used iron on hem tape to make them both. 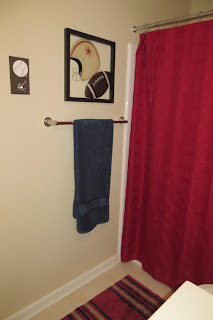 I cut the 2 squares of fabric to fit the pillow form with a couple of extra inches at the top and sides and with several extra inches at the bottom. Lay the 2 squares with the outside in and iron on hem tape at the top and sides. Let cool. Turn the pillow case inside out and insert the pillow form. 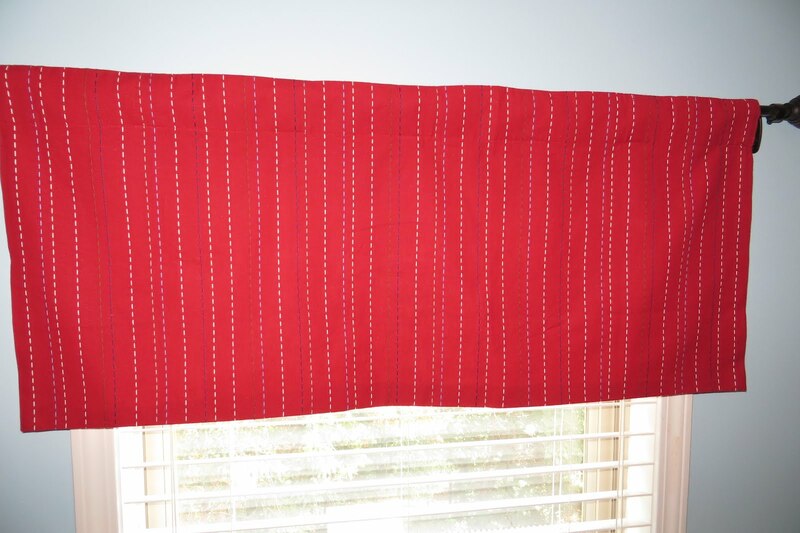 If needed, cut off excess fabric at the bottom. The bottom is the hardest part and definitely the part you don't want others to see as it just won't be as clean as the other 3 sides. 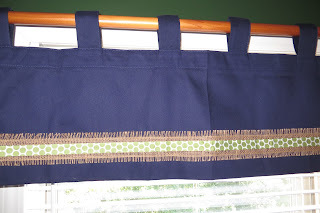 Fold the bottom fabric together and iron on the hem tape. 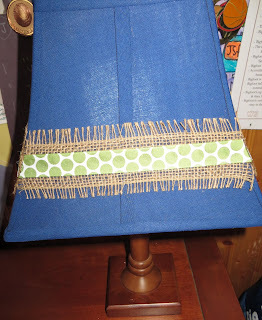 I made the 2 lamp shades with the same fabric. You can buy the self adhesive lamp shades at Hobby Lobby or online at Hollywood Lights. Just follow their directions! I made these pictures by painting 4 12x12 inch canvases white, red, navy, & light blue. 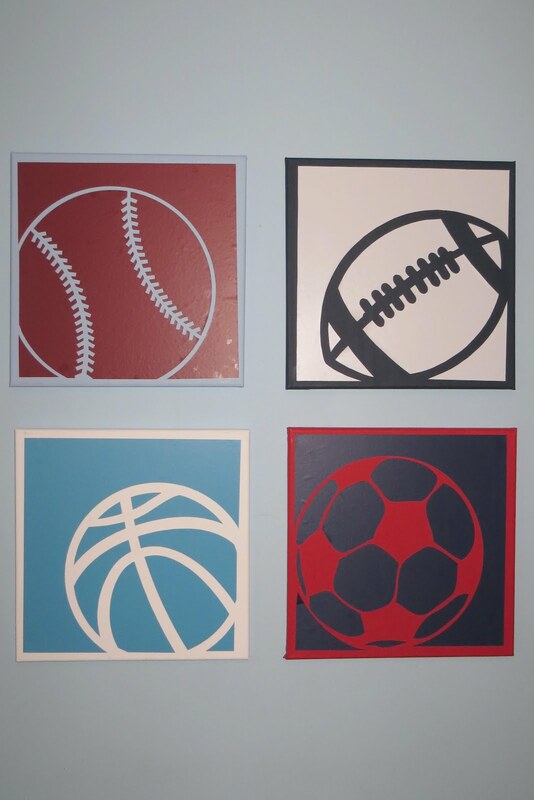 Then I used my Silhouette Cameo to cut the sports balls in different colors of vinyl and adhered them to the canvases. 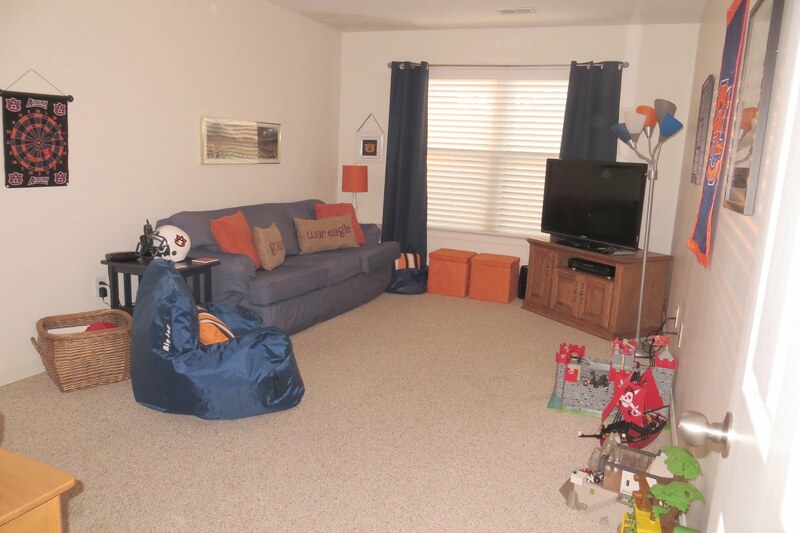 The playroom is Auburn themed with the main colors of navy & orange. I got the adorable burlap pillows on Etsy, the orange ottoman cubes at Target, the standing lamp at Walmart, and the curtain panels at Walmart. I decorated this dry erase board by gluing on the tiger ribbon. I also made new decoupage orange and blue clothespins for the playroom. I already had this metal tile. 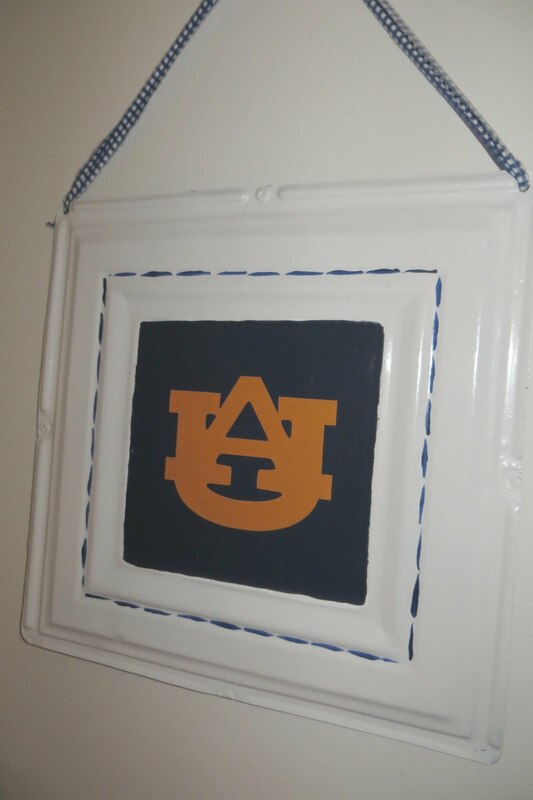 I painted the middle navy and added the orange vinyl AU using my Silhouette Cameo. I just "had" to make this frame Auburn-y too, so I removed the glass and splatter painted orange and blue acrylic paint on it. 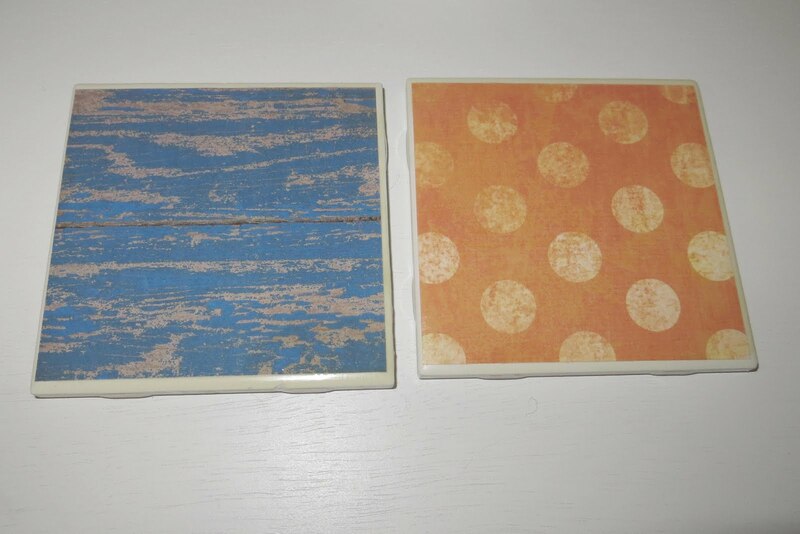 I made these orange & blue coasters for the playroom too. Simply purchase cheap white individual tiles at a home store. 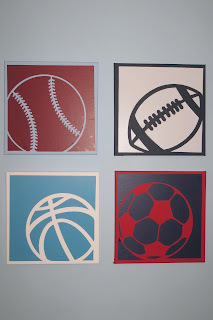 Cut scrapbook paper to fit the tiles (my pieces were 4x4 inch). 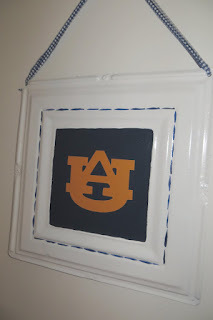 Use a paintbrush to paint Mod Podge on the tile and on the back of the scrapbook paper. 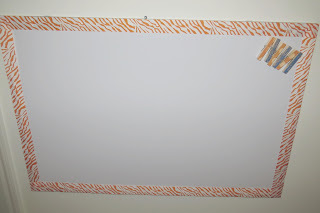 Put scrapbook paper on top of tile and let dry. 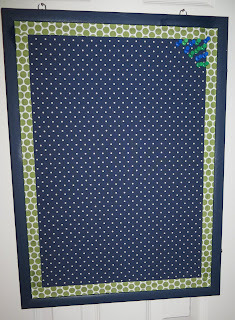 Paint a coat of Mod Podge over the top of scrapbook paper. Let dry. Since I thought these might be getting real wet, I added a coat of polyurethane too. I'm so happy with how it all turned out! I have a tendency to go overboard with a theme so I made an effort this time to concentrate more on the colors so that I would be able to redo the theme of the room without having to redo the whole room in the future. I also liked having the one common color of navy. 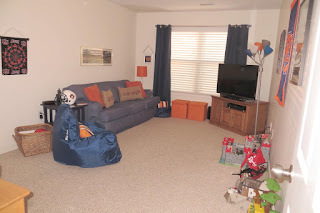 I decided to get navy bean bag chairs so that I can move them to any room and the colors would work. My boys love their new rooms!